Oil states expected to stick with Saudis: OPEC reality check. VIENNA, Austria (Bloomberg) -- OPEC members gathering in Vienna June 2 are expected to go along with a Saudi Arabia-led policy focused on squeezing out rivals amid signs the strategy is working. That means the meeting may be less fraught than the previous summit in December, which ended with public criticism of the Saudi position from Venezuela and Iran. By allowing prices to fall, high-cost producers are being forced out, easing the supply glut and spurring a rally of 80% since January to about $50/bbl. All but one of 27 analysts surveyed by Bloomberg said the Organization of Petroleum Exporting Countries will stick with the strategy. An alternative proposal—to freeze output—was finally rejected in Doha last month. The group may also choose a secretary-general to replace Abdalla El-Badri, whose term has been extended after members failed to agree on a successor. In recent months, three new hopefuls have emerged to try and break the impasse: Nigeria’s Mohammed Barkindo, Indonesia’s Mahendra Siregar and Venezuela’s Ali Rodriguez. Following are the latest comments from OPEC members and analysts. The respective shares of supply are based on April levels. The estimates for the price each member needs to balance its budget are from the International Monetary Fund unless stated otherwise. Price needed: $87.6 Share of OPEC production: 3.3%. Algeria tried, and failed, last year to organize a meeting of non-OPEC/OPEC members to push for output cuts, as years of declining crude production and low prices weighed on its fiscal deficit. A freeze by producers is needed immediately to stabilize prices, Salah Khebri, minister of energy and mines, said in an interview mid-May. “Our main message to the next OPEC meeting is that it needs to restore unity and work for the benefit of all members collectively,” he said. Angola is seeking an IMF loan as state revenue plunges. Its over-reliance on strong oil prices leaves savings and levels of inward investment ‘‘highly vulnerable’’ to swings in the global economy, Fitch unit BMI Research said in emailed report. Ecuador supported an oil-output freeze at the Doha meeting. Minister Jose Icaza met with his Venezuelan counterpart before the summit to discuss prices and seek to agree on a unified position. Icaza became Ecuador’s new oil minister in early May following the resignation of Carlos Pareja. Indonesia rejoined OPEC at the Dec. 4 meeting, seven years after suspending its membership. It will stick to its plan to increase oil output this year even if some of the world’s biggest producers move to cap production, Energy and Mineral Resources Minister Sudirman Said said in February. The Persian Gulf nation is rebuilding its energy industry and restoring crude sales after the lifting of international restrictions in January. Exports are already at 2 MMbpd, just short of pre-sanctions levels, the IEA said in a recent monthly oil market report. The head of the state oil company said the country—a key advocate of output restraint in previous years—has no plans to join any output freeze as it remains focused on restoring exports. Production has jumped more than 40% since mid-2014 and exports are at near-record levels. But plunging government revenue is hampering the state’s ability to invest, and OPEC’s second-biggest crude producer is reaching the limits of its capacity to store and export oil, according to analysts at Energy Aspects Ltd. and FGE. Oil Minister Adel Abdul Mahdi resigned in February amid ongoing political turmoil, his duties are being carried out by Fayyad Al-Nima. OPEC’s smallest producer. Competing administrations of Libya’s state-run National Oil Corp. in the east and west of the divided country agreed May 17 to resume exports from Hariga port to help revive production, which has dropped 80% since the 2011 uprising that ousted Muammar Qaddafi. It isn’t clear if it will send anyone to the meeting; it didn’t attend the Doha freeze talks in April. A resurgence in militant attacks in Nigeria’s oil-producing region has cut output to the lowest in 27 years, helping buoy global prices. An armed group calling itself the Niger Delta Avengers has warned of more attacks to come. Mohammed Al Sada, Qatar’s minister of energy and industry who is also president of OPEC, said global demand is catching up with supply and the market should see a “rebalancing” in the second half of the year as cheaper crude has forced some production to close. Qatar is expected to swing into a budget deficit this year, according to the IMF. Saudi Arabia will probably keep producing crude at near-record levels under new Energy Minister Khalid Al-Falih, an ally of Deputy Crown Prince Mohammed bin Salman. Prince Mohammed scuppered the oil-freeze plan, and Al-Falih’s appointment points to an “exceedingly high probability that there will be no Saudi agreement to freeze let alone cut production,” analysts including Ed Morse said in an emailed note dated May 9. U.A.E. still supports stability in the oil market, said Matar al Neyadi, the undersecretary of the energy ministry. Venezuela is one of the so-called Fragile Five OPEC members most at risk from significant instability amid the turmoil in prices, according to RBC Capital Markets LLC. Energy Minister Eulogio Del Pino was one of the most ardent advocates of the failed production-freeze agreement. While the country’s economy remains in critical condition, Caracas is probably resigned to the course set by Riyadh, said Jason Bordoff, director of the Center on Global Energy Policy at Columbia University in New York. CALGARY, Alberta -- The Canadian Association of Petroleum Producers (CAPP) has expressed disappointment with the New Brunswick government’s decision to extend the moratorium on hydraulic fracturing. “Industry has been working with the government to ensure world-class regulations and environmental protection is in place,” said Paul Barnes, manager of Atlantic Canada and Arctic. In March 2015, the New Brunswick Commission on Hydraulic Fracturing was created with a mandate to determine whether it would be possible to meet the five conditions set out by the New Brunswick government in order to lift the December 2014 moratorium. CAPP provided the commission with a written submission to address the five conditions, focusing on social, economic and environmental impacts of hydraulic fracturing in New Brunswick. The commission’s report was released in February 2016. The report indicates that increased natural gas development is an economic opportunity for New Brunswick. Natural gas will be consumed in large quantities by institutional, industrial and commercial users well into the future. With a moratorium in place, natural gas will likely come from another North American source that uses hydraulic fracturing and New Brunswick will lose the opportunity. Hydraulic fracturing has been done safely for more than 60 years in Canada. Comprehensive government regulations and industry practices are in place in jurisdictions where natural gas is produced, to ensure public safety and protection of the environment. These best practices are the result of collaborative efforts from industry, regulators and governments working together to ensure safe, reliable operations are in place. Saudi Arabia’s rising production, along with increased output from shale plays in the U.S. last year, exacerbated a global supply glut that drove down benchmark prices by more than 30% in 2015. OPEC, led by Saudi Arabia, chose in November 2014 to keep pumping crude to protect its share of the market rather than cutting output to boost prices. Last month, the Organization of Petroleum Exporting Countries and other major producers including Russia failed to reach an agreement over a proposal to freeze output to shore up prices after Saudi Arabia insisted that it couldn’t sign up to a deal without the participation of Iran, which has pledged to boost its own oil output to pre-sanctions levels before considering a cap. The Saudi company’s oil reserves were unchanged at 261.1 Bbbl, while reserves of gas increased to 297.6 Tscf from 294 Tscf. 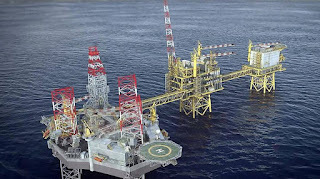 The company said it maintains an oil-production capacity of 12 MMbpd. Saudi Aramco is undergoing a major transformation that will include selling less than 5% of its shares to the public by the end of 2018. The company’s restructuring plan will be announced within six months, Deputy Crown Prince Mohammed bin Salman said in an interview in Riyadh on April 15. After the IPO, Saudi Aramco will become a holding company that is not involved in the daily management of its subsidiaries, he said. The company exported 2.6 Bbbl of crude in 2015, or 7.1 MMbpd, up from 2.54 Bbbl in 2014. Saudi Aramco’s exports to major Asian markets increased "substantially" last year from a year earlier, with shipments to India jumping 18%. Exports to China grew 4.5%. The company said it was able to maintain the same level of exports to U.S. market at 1 MMbpd "despite competition from shale oil." The operation of new local refineries helped Saudi Aramco’s exports of petroleum products to increase by 38%. Saudi Aramco’s fully-owned oil-refining capacity was 3.1 MMbpd at the end of last year, the same as in 2014, according to the report. The company’s total refining capacity was at 5.4 MMbpd in 2015. Saudi Aramco is seeking to double its refining capacity to between 8 MMbpd and 10 MMbpd, CEO Amin Nasser said in a March 9 interview. Last year, Saudi Aramco began exploring the development of a chemicals complex to be integrated with its SATORP joint venture with Total SA, it said in the review. VIENNA, Austria (Bloomberg) -- The final preparatory gathering of officials from the Organization of Petroleum Exporting Countries before the ministerial meeting on June 2 didn’t discuss any limits on crude output, the latest signal that the group will stick to its current strategy of letting low prices eradicate a supply glut. Discussions at the Economic Commission Board in Vienna, at which representatives of OPEC members review the market, focused on technical matters, said two people familiar with the matter, who asked not to be identified because the talks were private. Officials at the meeting concurred with OPEC’s most recent research report that supply and demand will start rebalancing in the second half of the year. Oil prices have rebounded more than 75% from the 12-year low reached in January as U.S. shale production falters, signaling that Saudi Arabia’s strategy to re-balance oversupplied world markets by squeezing high cost production is taking effect. After the group abandoned its production target in December, and failed to reach an accord with non-members to freeze oil supply last month, all but one of 27 analysts surveyed by Bloomberg said OPEC won’t set an output target at its next meeting. The meeting in Vienna also didn’t discuss potential candidates to replace Secretary-General Abdalla El-Badri, whose term expires in July, said two people familiar with the matter. HOUSTON -- BP has started up a major water injection project at its Thunder Horse platform, extending the production life of one of the biggest deepwater fields in the U.S. Gulf of Mexico. The project, which reflects BP’s strategy of continued investment in its existing deepwater Gulf of Mexico production hubs, will boost recovery of oil and natural gas from one of Thunder Horse field’s three main reservoirs. Over the past three years, BP refurbished the platform’s existing topsides and subsea equipment while also drilling two water-injection wells at the site. From those wells, water will be injected into the reservoir to increase pressure and enhance production. The improvements are expected to allow the Thunder Horse facility to recover an additional 65 MMboe over time. The project is the second of five major upstream projects BP expects to bring online in 2016. It is part of BP’s plan to add approximately 800,000 boed of new production globally from projects starting up between 2015 and 2020. The Thunder Horse platform, which sits in more than 6,000 ft of water and began production in June 2008, has the capacity to handle 250,000 bopd and 200 MMcfd of natural gas. The facility continued to operate while work on the water injection project was underway. In the deepwater Gulf of Mexico, BP operates four large production platforms—Thunder Horse, Atlantis, Mad Dog and Na Kika—and holds interests in four non-operated hubs—Mars, Mars B, Ursa and Great White. KUWAIT (Bloomberg) -- The surge in the global supply of shale oil has curbed OPEC’s ability to balance crude markets, a former Qatari energy minister said. The Organization of Petroleum Exporting Countries was able to balance the market in the past because output from shale oil deposits in the U.S. and other non-OPEC nations was insignificant, Abdullah bin Hamad al-Attiyah told reporters at an industry event in Doha. “OPEC can’t act as swing producer because it will lose market share,” he said Wednesday, referring to the group’s traditional practice of varying output to manage crude prices. Al-Attiyah was energy minister of Qatar, an OPEC member, from 1992 to 2011. Crude prices tumbled more than 75% from their 2014 peak due to a global glut fed partly by production at shale deposits in the U.S. OPEC, which pumps about 40% of the world’s oil, meets in Vienna on June 2 to assess its output policy. The group is unlikely to set a production target as it sticks with Saudi Arabia’s strategy of squeezing out rivals such as higher-cost shale drillers, according to all but one of 27 analysts surveyed by Bloomberg. Crude has surged more than 80% from a 12-year low earlier this year on signs the global oversupply will ease amid declining output in Nigeria and non-OPEC countries, including the U.S. Brent for July settlement increased 95 cents, or 2%, to $49.56/bbl on the London-based ICE Futures Europe exchange. “The issue now for OPEC members is how to diversify your economy from oil and gas,” Mandil told reporters in the Qatari capital. Mandil headed the IEA, a watchdog agency for the world’s most industrialized countries, from 2003 to 2007. 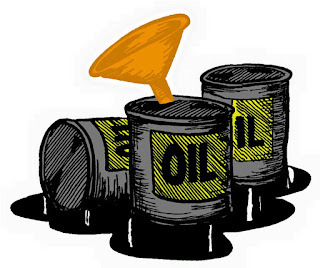 Al-Attiyah estimated current global inventories at about 5 Bbbl of oil, including crude in floating storage, and said the market is oversupplied by about 1.5 MMbpd. “Just to cut production by 1.5 MMbpd and the next day the price goes up and the other producers will take the whole share--there is no benefit for OPEC in that,” he said. High oil prices in recent years were an incentive for many high-cost fields to be tapped, Al-Atiyyah said. If shale oil companies were to collapse due to financial strain imposed by low prices, this might cause another crisis like the one in 2007 and 2008, as many of them owe large debts to banks, he said. “OPEC can’t go out and fight on behalf of others,” he said. THE HAGUE (Bloomberg) -- Royal Dutch Shell will cut 2,200 more jobs, taking the total tally of losses to 12,500 from 2015 to 2016 as the world’s second-biggest oil company continues to adjust to the slump in prices. At least 5,000 jobs will be cut this year, the company said in an emailed statement. These reductions are in response to oil prices staying “lower for longer,” and as a result of the acquisition of BG Group earlier this year, said Paul Goodfellow, Shell’s V.P. for the UK and Ireland. The industry is cutting deeper despite oil’s 80% recovery since January. Prices remain about half the level of two years ago and companies’ earnings have been pummeled, debt has increased and credit ratings have been cut. To help protect their balance sheets they have deferred or canceled billions of dollars of projects, renegotiated contracts with suppliers and eliminated thousands of jobs. Shell’s adjusted net income fell 58% to $1.6 billion in the first quarter following the collapse in prices. The company bought BG Group for $54 billion this year to get access to oil and natural gas reserves from Australia to Brazil. The purchase has increased its debt to $70 billion and driven up its ratio of net debt to capital to above 26%. OSLO, Norway -- DNO’s Hayah-1 exploration well, in Oman's Block 36, failed to encounter hydrocarbons other than minor gas shows and will be plugged and abandoned, the company said in a statement. 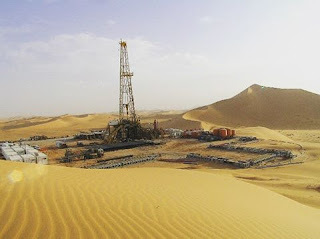 The well, drilled in the Rub al-Khali basin in the southwestern part of the country, reached a total depth of 3,010 m and penetrated the three target reservoirs, of which two had good reservoir quality. DNO will incorporate the Hayah-1 well information into further evaluation of the block. DNO operates Block 36 with a 75% operated interest; Allied Petroleum Exploration Inc. holds the remaining 25%. BEIJING (Bloomberg) -- In late February, the tanker Jag Lok loaded oil from Equatorial Guinea in western Africa and set sail for the Chinese port of Qingdao, the gateway to the world’s newest buyers of crude, a journey of more than 12,000 nautical miles. After reaching its destination in early April, the ship churned in circles for 20 days before it got a chance to deliver its cargo. That’s because the port in Shandong province was struggling to handle a record number of vessels arriving to supply the privately held refineries called “teapots” that dot the region, ship-tracking data compiled by Bloomberg show. The backup illustrates the challenges facing the independent refiners, which have emerged as a bright spot of rising demand amid a global glut. The processors are forecast by ICIS-China to purchase a combined 1 MMbopd from overseas this year, up from 620,000 bopd in 2015. While small individually, together they account for almost a third of China’s refining capacity. Any curb on imports would threaten oil’s rebound from a 12-year low, according to Nomura Holdings Inc. and Samsung Futures Inc.
From being dependent on state-owned energy giants for their feedstock needs as little as a year ago, teapots are now driving Chinese crude purchases after the government allowed them to buy overseas supplies directly. As of end-February, 27 of the companies had received or applied for annual import quotas totaling 89.5 million metric tons, or about 1.8 MMbopd, according to Zhang Liucheng, chairman of the China Petroleum Purchase Federation of Independent Refinery, a group of 16 processors. Total purchases from overseas into the world’s second-largest oil user climbed to a near record 7.96 MMbopd in April, while shipments to Qingdao surged to unprecedented levels in April. Still, with infrastructure not developing as fast as oil purchases, imports are at risk of slowing because of the ship traffic and lack of storage capacity, according to BMI Research. Concern about the creditworthiness of companies with no prior experience in international trade is also deterring some sellers. Slowing refining profits mean the plants may have to cut processing rates, weakening their appetite for cargoes from overseas, while the implementation of higher fuel quality standards could force some of them to shut. To ease purchasing from foreign suppliers, 16 of the refiners banded together in February to form an alliance. Its aim is to better negotiate bulk purchases as the newest buyers in the physical oil-trading market and improve their credibility. Zhang, the chairman, said it seeks term contracts of two to three years. The independents’ attractiveness to global producers was highlighted last month when one of the refiners purchased a spot cargo from Saudi Arabia, which broke from its usual policy of selling only under long-term contracts. Yet, they are discovering that it’s not easy to break into the oil market even amid a glut. “Teapot buying could slow due to logistical constraints which are already stretched to their limits,” said Nevyn Nah, a Singapore-based analyst at consultant firm Energy Aspects Ltd.
Apart from the traffic at Qingdao, China’s fight against pollution poses another risk to purchases by teapots. Part of President Xi Jinping’s efforts to tackle the smog that’s shortening lives and has prompted social unrest is a drive to adopt higher fuel-quality standards from January 2017. To comply, the nation’s refineries will need to upgrade with new equipment and technology, which may be beyond the means of some private processors, according to BMI Research, a unit of Fitch Group. A drop in refining margins amid surging fuel stockpiles and a jump in crude prices this year is another potential dampener. The profit from turning Middle East benchmark Dubai crude into oil products in Asia is at $4.92/bbl as of the end of last week, about 34% lower from late March, data compiled by Bloomberg show. Brent crude, the benchmark for more than half the world’s oil, traded at $48.17/bbl by 11:26 a.m. in London. Prices have surged more than 70% from a 12-year low they hit in January. Meanwhile, ships continue to be held up at Qingdao. At least 16 oil tankers with capacity to carry 21.2 MMbbl have stayed near the port for more than 10 days over May 1-23. Half of them were there for more than a month, according to ship-tracking data compiled by Bloomberg. 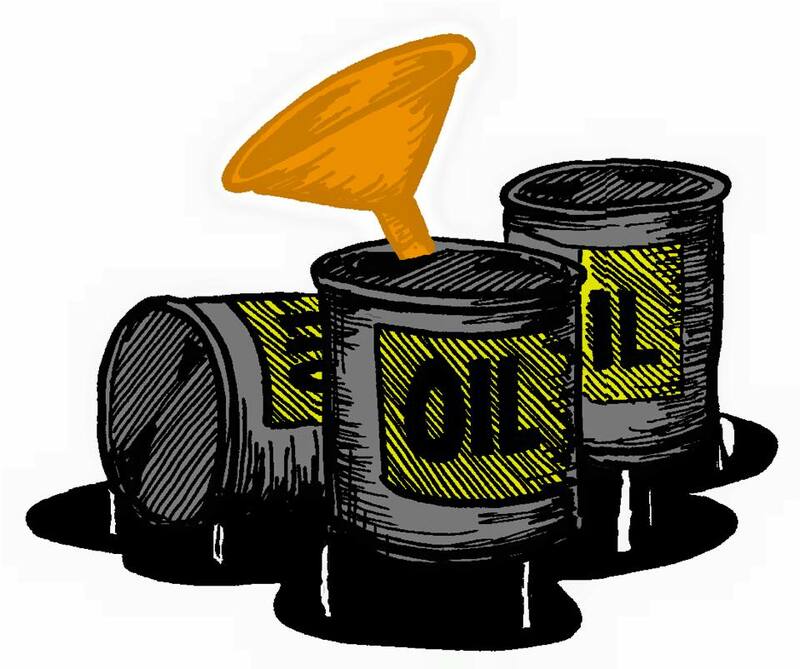 VIENNA, Austria (Bloomberg) -- After failing to reach an accord on oil supply in Doha last month, OPEC is poised to go another meeting with no agreement on how much crude to produce. All but one of 27 analysts surveyed by Bloomberg said the Organization of Petroleum Exporting Countries won’t set an output target on June 2, as it sticks with Saudi Arabia’s strategy of squeezing out rivals including U.S. shale drillers by pumping near-record volumes. An accord on an output cap with non-members such as Russia collapsed in Doha last month when Saudi officials insisted Iran would need to take part. Oil has rebounded almost 80% to $48.35/bbl in London from the 12-year low reached in January as depressed prices take their toll on supplies. The International Energy Agency and Goldman Sachs Group Inc. say the crude glut is dissipating, signaling that the Saudi approach—opposed by most OPEC members when it was unveiled in late 2014—is finally paying off. “The strategy is in the process of working—I don’t think they have much incentive to particularly do anything,” said Mike Wittner, head of oil-market research at Societe Generale SA. Even if they did, political tensions between Saudi Arabia and Iran thwart cooperation as seen at the Doha summit and at OPEC’s meeting last December, both of which were “pretty chaotic,” he said. The head of Iran’s state oil company said at the weekend that the country has no plans to join any output freeze since it’s still ramping up exports to pre-sanctions levels. Iranian shipments probably won’t surpass 2.2 MMbpd until midsummer, Rokneddin Javadi, managing director of National Iranian Oil Co., told Mehr news agency. Exports last reached that level before sanctions were imposed more than four years ago. OPEC’s ministerial meeting in December ended without any agreement on an output ceiling as the group abandoned the target of 30 MMbopd that it had held—and mostly ignored—since late 2011. The group’s current policy, which allows members to produce as much as they choose with no need for coordination, calls the organization’s basic purpose into question, said Eugen Weinberg, head of commodities research at Commerzbank AG in Frankfurt. LONDON (Bloomberg) -- Algeria has more drilling rigs than the rest of Africa combined, yet oil production still isn’t recovering after years of decline. It’s little wonder the nation remains one of the most vocal supporters of action to increase prices by curbing output at the OPEC meeting next month. The Organization of Petroleum Exporting Countries has been hit hard by the decline in oil prices. Algeria, like other members, is rolling out economic reforms to deal with the consequences of the slump, which include the nation’s first current-account deficit in more than a decade. Unlike Saudi Arabia and Iraq, it’s been unable to soften the blow by boosting output. Decades after the discovery of Algeria’s first major oil fields in the 1950s, the nation’s exploration success rate has fallen to less than one well in five, according to data from state oil company Sonatrach Group. Last year, it drilled 149 wells and only made 22 minor finds. Crude output for the past two years has remained at about 1.1 MMbpd, data compiled by Bloomberg show. Algeria had 36 rigs drilling for oil last month, two thirds of the total for the African continent, according to data from Baker Hughes Inc. Nigeria, which produced 600,000 bpd more crude than Algeria in April, had just six operating rigs, the data show. While Algeria plans to buy eight more rigs this year, it isn’t making greater discoveries. geria’s income from oil and gas exports, which account for nearly 60% of the economy and 95% of foreign receipts, has plunged by almost half since crude prices tumbled. While large currency reserves and low levels of foreign debt have helped the nation to weather the storm, a prolonged slump could threaten subsidies on housing and basic foodstuffs that curbed internal dissent since the Arab Spring. Algeria’s economy is “facing a severe and likely long-lasting external shock,” the International Monetary Fund said May 19. The price of international benchmark Brent crude was about $48/bbl Monday. That’s an increase of 77% from a 12-year low in January, but still well below the $87.60 the IMF says Algeria needs to balance its budget. OPEC will meet in Vienna on June 2 to discuss output policy and Algeria looks set to continue its two-year push for action to boost prices. The nation tried and failed in August to persuade fellow members to hold an emergency meeting to boost prices. Two months later, a joint effort with Venezuela to organize a summit of heads of state from OPEC and non-OPEC countries received little support. When it meets next month, the group should “focus on the interests of all countries,” by freezing production immediately to stabilize prices, Algeria’s Minister of Energy and Mines Salah Khebri said in an interview May 16. All but 1 of 27 analysts surveyed by Bloomberg said OPEC won’t set an output target at the next meeting, as it sticks with Saudi Arabia’s strategy to squeeze out rivals including U.S. shale drillers by pumping near-record volumes. Sonatrach’s V.P. of exploration and production, Salah Mekmouche, said in December that its drilling efforts are yielding results. The country plans to raise crude output by 5% this year as fields discovered five to six years ago come online, he said. It is also shifting the focus of its drilling closer to existing production facilities, which would be simpler and less expensive to develop than new areas. Algeria is a country that is under explored, said Sid Ali Betata, president of the National Agency for the Development of Hydrocarbon Resources, with an average of 15 wells per 10,000 km2. However, drilling has become too expensive, he said. The nation lacks the funds and foreign investment needed to underpin a long-term recovery in output. Of the 31 oil and gas exploration blocks offered in tender in the last auction in 2014, only four permits were awarded. Corruption probes at Sonatrach, the threat of terrorism from both the regional al-Qaeda affiliate and Islamic State, and uncertainty over the health of President Abdelaziz Bouteflika, 79, has dimmed the nation’s appeal to investors. The government is working to change perceptions. Algiers hosted a joint conference for foreign investors with the UK on Sunday and plans another with the European Union on Tuesday. In the long term it seeks to change regulations, increase deliveries of natural gas to Europe, develop renewables and increase energy efficiency. This is not the right time to offer oil and gas exploration rights because low prices discourage companies from bidding, Energy Minister Khebri said in Algiers Sunday. “We are now engaged in direct negotiations with foreign oil and gas companies to seek their views for the right moment to hold the bidding round,” he said. In the meantime, the drills will keep turning, but won’t do enough to solve the nation’s problems, said Mohamed Said Beghoul, a former director of exploration at Sonatrach and industry veteran of 30 years. MUMBAI, India (Bloomberg) -- Cairn India Ltd. said its CEO Mayank Ashar resigned citing personal reasons, just a month after the nation’s largest private oil producer posted its biggest quarterly loss. Ashar will step down on June 5 and will be replaced by CFO Sudhir Mathur as interim head of the company, Cairn India said in a stock exchange filing on Friday. Ashar, who took charge in October 2014, oversaw the company amid the worst ever slide in oil prices and an ongoing process of merger with parent Vedanta Ltd. In January, Cairn India said the merger will take at least six more months. Ashar did not respond to an email seeking comment. 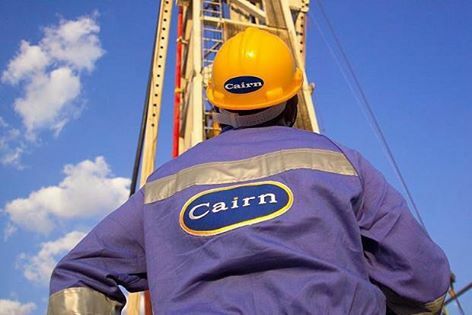 Cairn last month reported a group net loss of 109.5 billion rupees ($1.6 billion) in the three months ended March, that was wider than a mean loss estimate of 915.4 million rupees. The company’s shares have fallen 31% in the past year following the slump in oil prices and uncertainty over the merger with Vedanta, which was announced in June. Brent oil has slipped 25% in the past 12 months. “As it is, the stock has got hammered last few weeks and there will be some uncertainty now, which will be negative for the stock in the near term,” SBI Capital’s Agarwal said. MEXICO CITY (Bloomberg) -- Petroleos Mexicanos is in talks with Exxon Mobil Corp., Total and Chevron Corp. as Mexico’s struggling state-run oil producer seeks partners to develop deepwater crude in the Gulf of Mexico. Pemex may also start discussions with Oslo-based Statoil ASA, according to company press officials who asked not to be named because of policy. Pemex seeks Areas of Mutual Interest agreements to evaluate whether the companies have opportunities to work together in offshore areas. The talks would indicate the world’s oil majors are interested in partnering with Pemex to produce the country’s underdeveloped crude reserves or bid with Mexico’s state-owned operator in the country’s first-ever deepwater auctions in December. Pemex, which deferred investments in deepwater fields this year amid a $5.5-billion budget cut, has reiterated that it seeks to partner with the world’s largest producers to develop Mexico’s crude reserves, estimated by the country’s oil regulator at the equivalent of 10.24 Bbbl of crude at the end of last year. "They will use the tools in the energy reform to do this," Nymia Almeida, a senior credit officer for Moody’s, said at a conference in New York, when asked about Pemex forming partnerships and selling assets, which the company intends to do. "Any deal would be better than none, even if it starts little by little." Hakon Fonseca Nordang, head of communication for Statoil in the U.S. and Mexico, declined to comment on any discussions, saying that Statoil and Pemex have for years had a General Cooperation Agreement involving research and technology exchange between the two companies. Scott Silvestri, an Exxon spokesman, declined to comment, as did Isabel Ordonez, a spokeswoman for Chevron in Latin America. Mexico hopes to raise $44 billion in investment in its first-ever sale of deepwater areas in the Gulf of Mexico, scheduled for Dec. 5. The country will auction 10 areas in the Perdido area near the maritime border with the U.S. and in the southern gulf’s Cuenca Salina. Seventy-six percent of the country’s prospective oil resources are located in the deep waters of the Gulf of Mexico, according to Energy Minister Pedro Joaquin Coldwell. Pemex, Statoil, Chevron and Exxon are among 16 companies that are in the process to qualify to bid in the deep water auctions. 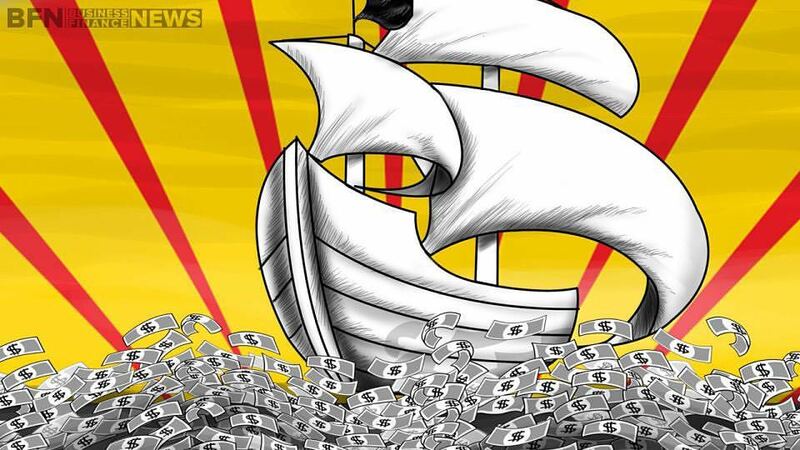 THE HAGUE (Bloomberg) -- Royal Dutch Shell is in talks with potential buyers for some North Sea assets, mostly fields it got this year as part of the record acquisition of BG Group, according to people familiar with the matter. The Anglo-Dutch energy giant has been in talks with companies including privately held chemical producer Ineos Group AG and Neptune Oil & Gas, set up by former Centrica Plc chief Sam Laidlaw, the people said, asking not to be identified as the information is private. Shell is seeking to sell a package of assets and is talking with companies to gauge their interest before a formal sale process is launched, the people said. No final decision has been made and Shell may decide to retain the properties, they said. Europe’s biggest oil company is planning to raise $30 billion from asset sales in three years after the $54-billion acquisition of BG increased debt and lowered its credit rating. While the move made Shell the world’s second-biggest oil company by market value, it also brought it properties in areas like the North Sea where costs are high. Crude continues to trade below $50, making it difficult for Shell to sell oil fields at what it thinks is a good price. A representative for Neptune didn’t respond to calls and emails requesting comment. A spokesman for Ineos couldn’t be reached by phone or email. BG operated oil and gas assets in the UK North Sea including the Armada project and the Everest and Lomond fields, according to the company’s website. It also had stakes in fields operated by others, including Nexen’s Buzzard and the Total SA-operated Elgin and Franklin projects, as well as some offshore pipelines. n the UK North Sea, including the Brent project, oil from which is used to set the global price benchmark, according to its website. Brent crude was at about $59/bbl the day before Shell announced the BG acquisition in April last year. Prices dropped to below $40 when the deal was completed in mid-February and remain under $50. The slump in prices over the last two years has forced Shell and other oil companies to shrink their business, sell assets, defer and close projects and eliminate staff. 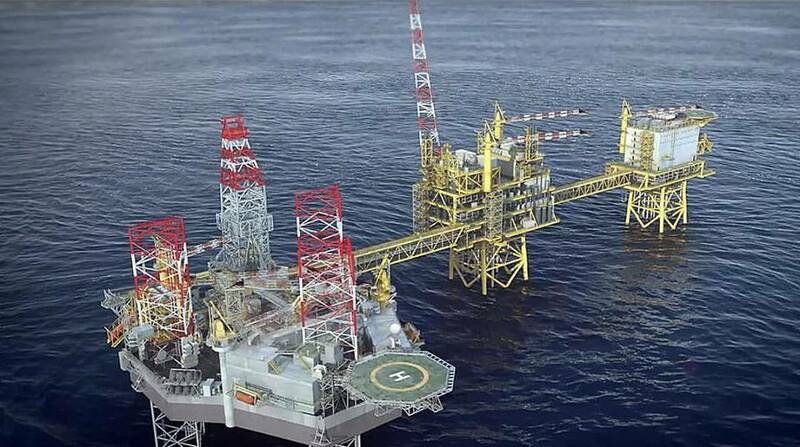 Some of the cutbacks have happened in the UK North Sea, where operating costs remain high. The BG acquisition pushed up Shell’s net debt to about $70 billion at the end of March, making it Europe’s most indebted non-financial company. Its gearing—or net debt to total capital—increased to above 26% from 14% at the end of last year. Assets linked to Shell’s interests in Trinidad & Tobago and stakes in oil and gas fields in India may be on the block, people familiar with the matter said in March. PARIS (Bloomberg) -- Total SA CEO Patrick Pouyanne said plans to ban imports of U.S. shale gas to France may be unworkable. “I don’t know how it would be possible to do it,” Pouyanne said Wednesday at a hearing of the French Senate. “The gas is liquefied in the U.S., and shale and conventional gas are mixed together in pipelines.” You can’t then separate them, he said. Energy and Environment Minister Segolene Royal said this month that she will “examine from a legal standpoint” ways to ban imports of shale gas, and has asked Electricite de France SA and Engie SA to import only conventional gas. France barred fracing in 2011 on environmental grounds. Houston-based Cheniere Energy Inc. has contracts to deliver LNG to Engie, EDF and Total. “The price of gas in Europe has dropped because of American LNG,” Pouyanne said. 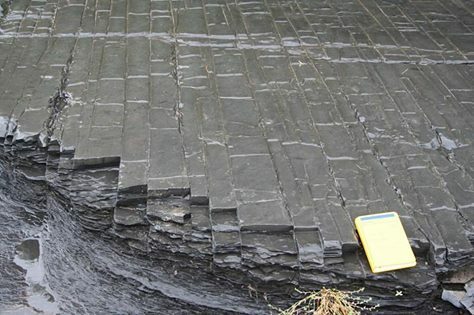 STAVANGER, Norway -- Norway’s Ministry of Petroleum and Energy has offered new production licenses to thirteen companies in the 23rd licensing round on the Norwegian Continental Shelf. 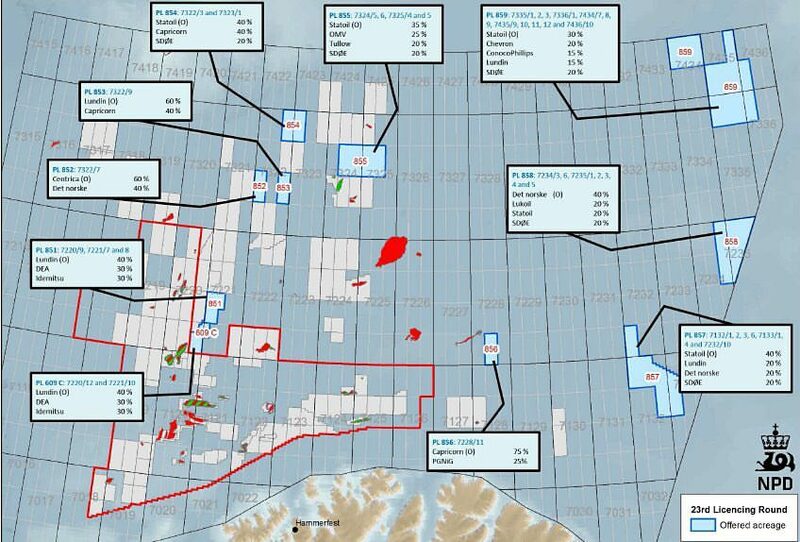 All ten production licenses are located in the Barents Sea. The offers were issued following the authorities’ assessment of applications from 26 companies. When the 23rd licensing round was announced in January 2015, it marked 50 years since the announcement of the very first licensing round on the NCS. For the first time since 1994, new exploration acreage was made available in the southeastern Barents Sea. Sissel Eriksen, director of exploration, Norwegian Petroleum Directorate, is pleased with the present results of the latest licensing round. “I am eagerly awaiting the result of the first exploration well,” she said. Three production licenses were awarded in the new area in the southeastern Barents Sea. The authorities have prepared binding work programs that include a requirement for four exploration wells within three years in the three production licenses in the southeastern Barents Sea. Eriksen is hopeful that the first exploration well will be in place as early as next year. 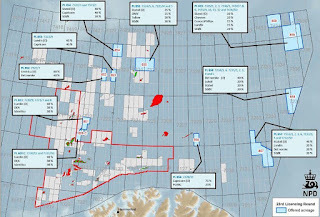 In addition to the three production licenses in the southeastern Barents Sea, Eriksen drew attention to the new blocks awarded in the area surrounding the Alta and Wisting discoveries, with a view to strengthening the resource base for future developments. She also emphasized that the areas awarded are important in the search for more knowledge about the Barents Sea generally, for the benefit of further exploration of the area. HOUSTON -- Nine Energy Service successfully completed 124 perforated stages in an 18,544 ft lateral (27,034 ft TMD) in Guernsey County, Ohio, for Eclipse Resources, a premier independent E&P company in the Appalachian basin. In one of the most complex wells ever completed by either company, Nine’s Wireline Division worked directly with Eclipse to design the plug and perf system through Cerebus Well Modeling software, enabling more effective planning and deployment of cable-conveyed tools. Nine completed all 124 stages in 23.5 days without any non-productive time. 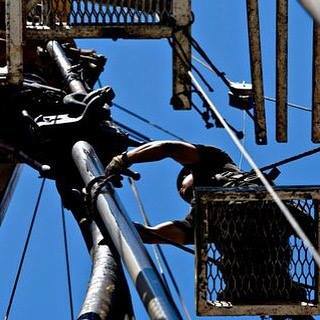 Kyle Bradford, completions manager for Eclipse Resources added, “Nine was the only wireline company that we considered. We knew with such a technical well, there would be a number of challenges and we needed a partner that we could rely on to execute at the wellsite and who could quickly address any problems. 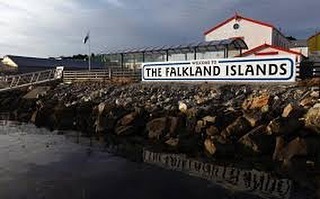 LONDON (Bloomberg) -- Rockhopper Exploration confirmed potential oil resources in a discovery in the Falklands basin, sending its shares higher. An independent audit showed that the best estimate of contingent resources—also known as 2C resources—at the Sea Lion complex came in at 517 MMbbl, of which London-based Rockhopper’s share is 258 MMbbl, it said Tuesday in a statement. Today’s announcement is higher than the 482 MMbbl Bank of Montreal was expecting. Shares in Rockhopper gained as much as 6.2% to trade at 38.75 pence a share in London, the highest in two weeks. They were 3.4% higher as of 9:17 a.m. Premier Oil Plc, a London-based explorer with a 60% stake in Sea Lion, gained 2.9% to 79.75 pence a share. “The current size of Sea Lion at over 500 MMbbl is good to see, helping confirm a significant second phase beyond the current development,” Daniel Slater, research director at Arden Partners Plc, said in a note. LONDON -- BP announced today it has doubled its interest in the Culzean development in the UK Central North Sea, following its acquisition of an additional 16% interest from JX Nippon. Discovered in 2008, the gas condensate field has resources estimated at 250-300 MMboe. Production is expected to start in 2019 and continue into the 2030s, with plateau production of 60,000-90,000 boepd. AMMAN, Jordan (Bloomberg) -- Algeria will supply oil and other energy products to Jordan for the first time under a memorandum of understanding signed on Monday, as the OPEC member seeks to diversify sales after years of stagnating crude production. Algeria’s state-run Sonatrach Group will start shipping liquefied natural gas and liquefied petroleum gas to Jordan in September, followed by crude oil, Algerian Energy Minister Salah Khebri said in an interview in Amman. Sonatrach and National Electric Power Co. of Jordan should reach a final agreement in the next few weeks, he said, without specifying shipment volumes. Sonatrach will also explore for oil and gas in Jordan. “This is the first time that we are going to get fuel and gas from Algeria,” Hasan Hiari, head of the natural gas department at Jordan’s Ministry of Energy & Mineral Resources, said in a separate interview in Amman. "We are keen on diversifying our energy sources." Algeria, Africa’s biggest natural gas producer, has invited international companies to help develop its oil and gas fields as Sonatrach has struggled to raise production after a corruption probe at the company and a deadly al-Qaeda terrorist attack in 2013 at the In Amenas gas field. 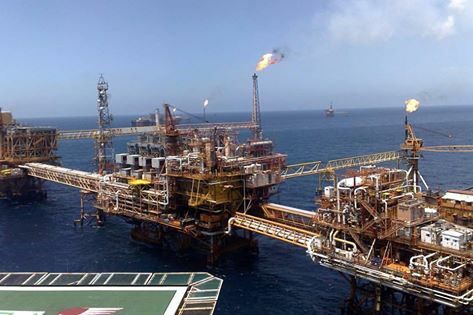 The nation operated 55 oil rigs in April, an increase in each month since November, according to Baker Hughes Inc. Algeria pumped 1.1 MMbpd of crude in April, its production little changed since 2013. Oil-producing nations increasingly face the challenge of meeting higher demand rather than cutting supply to support prices. The International Energy Agency on May 12 boosted its forecast for world oil demand this year by 100,000 bpd, and Goldman Sachs Group Inc. said on May 15 that the oil market has flipped to a deficit in output sooner than it expected. Benchmark Brent crude has climbed 31% this year as supplies were tightened by a decline in U.S. drilling, wildfires in Canada and disruptions in Nigeria. Algeria, the ninth-biggest member of the Organization of Petroleum Exporting Countries, plans to raise crude output by 5% in 2016 and offer energy-exploration rights to foreign companies, Salah Mekmouche, Sonatrach V.P. of exploration and production, said in an interview in Algiers in December. Natural gas pipeline flows from Algeria, the European Union’s third-biggest supplier, into Italy reached a three-year high in April, data from Italian grid Snam Rete Gas SpA show. Jordan, which has almost no energy resources of its own, is also looking at solar, wind and nuclear power for future energy needs. By 2025, 48 percent of the nation’s electricity will be generated by nuclear reactors, up from 4% today, Prime Minister Abdullah Ensour said Monday at an energy conference in Amman. It plans to have 500 megawatts of solar- and wind-power capacity operational by the end of this year.